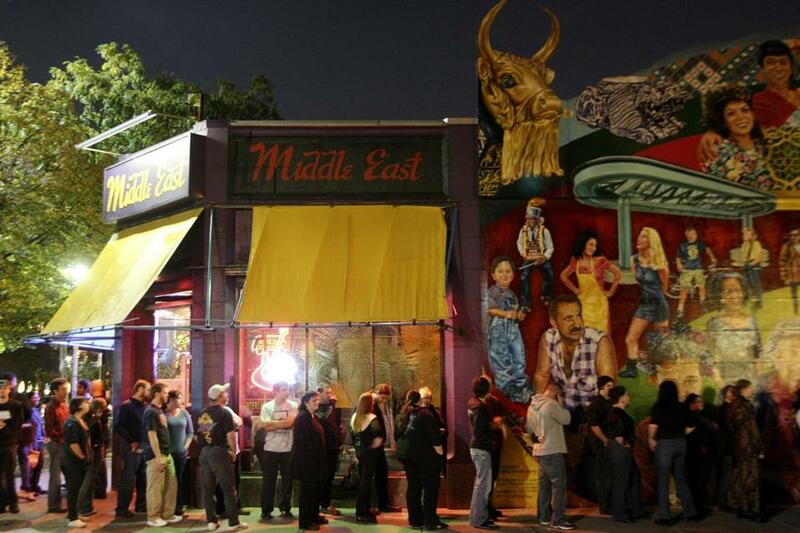 Patrons lined up outside the Middle East in Cambridge in 2008. Facing persistent sexual misconduct allegations that he insists are false, a co-owner of the storied Middle East nightclub has resigned as manager of the club. Joseph Sater, 66, who owns the music venue with his brother, has faced secondhand claims of sexual misconduct since the #MeToo movement began in October. The assertions, which ricocheted online, led to boycotts by bands, DJs, and even patrons of the Middle East, who avoided the music venue to stand in solidarity with purported victims. The Middle East, founded in 1974 by Sater and his brother, Nabil, has been a mainstay of the indie rock scene in Greater Boston for decades. In their statement, the owners expressed frustration with the way their venue is now being characterized. The crisis struck last fall, when a DJ posted claims online alleging that one of the owners of the club had assaulted several women. The details were scant and the women, unnamed, but the blowback was immediate. Performers immediately canceled their shows and issued statements of protest. “It’s our number one priority to ensure the safety and comfort of anyone attending our shows,” wrote the band Horse Jumper Of Love. Still, no victims came forward publicly, and Cambridge Police did not receive any complaints about the Middle East, Jeremy Warnick, a spokesman, said Wednesday. But after taking a leave of absence from the club in the wake of the online publicity, Sater returned after four months, Pickert wrote, dashing his hopes that his “toxic work environment” could be healed. Through a spokesman, Sater declined to elaborate on the leave he took. “I stepped away from day-to-day operations for a couple of months because I believed it was in the best interest of the business at that time,” he said. Sater also said he was not forced out of the job due to the boycott. Some expressed skepticism about the owners’ statement and said they will continue to boycott the venue as long as Sater remains a co-owner. Dugan Arnett of the Globe Staff contributed. Stephanie Ebbert can be reached at Stephanie.Ebbert@globe.com. Follow her on Twitter @StephanieEbbert.